As a professional, I feel its very important when visiting clients to maintain a professional appearance. Its also important that they remember you, and the easiest way to ensure that, is to stand out from the crowd. Thats why I have a Mickey Mouse handbag. 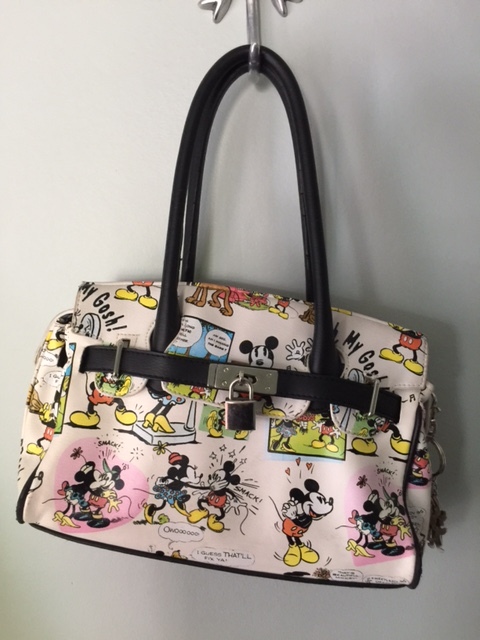 I can guarantee none of my workmates (who I admit are mostly men) have a Mickey Mouse handbag as part of their standard work attire. I know the Dooney & Burke Disney bags are highly collectible and sought after. I personally don’t like them and think they are overpriced, so this is a just a cheap one but it does the job and fits perfectly into the basket on my bike. Do you ever get any comments about domestic violence with Minnie giving the boy a quick smack. Thanks, I’ll be sad when I wear it out.